When I was first drawing up spaceships for Starsector we determined what to make based mostly on what felt right according to the conceit of idealized WW2-era naval combat in space. Obviously we needed a big battleship (the Onslaught), cheap swarming fighters (the Talon), a nimble frigate (the Wolf), and a giant carrier (the Astral), etc. The roles and variations of ships pretty much suggest themselves, and the form follows their function. If it’s a battleship, it should look like its tough and packs a heck of a punch. I’ve certainly drawn a few ships without a hard plan upfront but even then I’m always thinking about what kind of role the ship in question is going to play in the game. Now I’m taking on more of a role in writing setting & backstory for Starsector. When drawing a ship I’ll think not only of the gameplay function but of the narrative role it fulfills; The possibilities are absolutely fascinating! 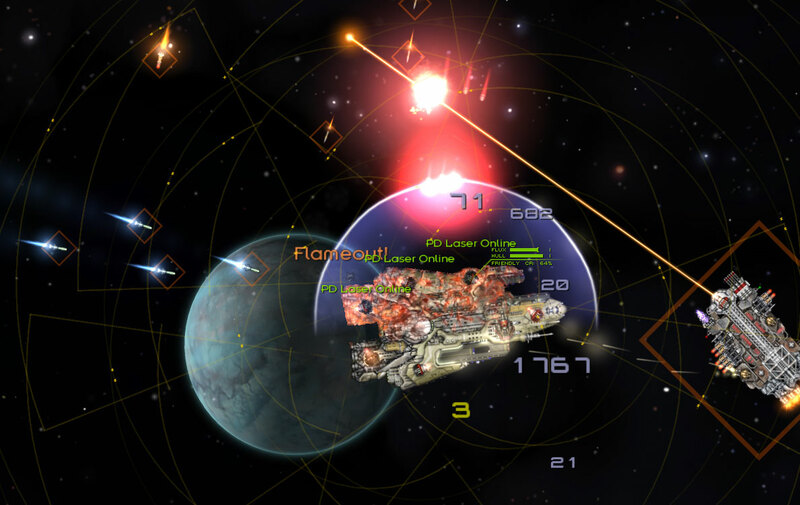 A simple sprite can, given appropriate text, suggest an awful lot about the universe it exists within and it can draw connections to other ships, factions, places, history, and all of that to emotional responses from the player as they decide how they feel about the ships, factions, and places in the universe of Starsector. Each piece becomes something far greater than the sum of its parts when this all operates together (and I love this part of game development). Okay, that’s enough rambling: I’ll show off some new ships, discuss their envisioned role in gameplay (which we recognize, dear players, is not necessarily how you’re going to use them), then a bit about how their backstory fits together with the rest of Starsector. In terms of backstory, this is as you can see an older model and it would not have seen great use in the Domain era (as in, pre-Gate system collapse) except in those scattered areas with active uprisings against Domain authority or in the especially wild hinterlands and frontiers of the Galaxy. Times have changed however and an armed & armoured tramp freighter is simply a Good Idea. Plus, computer models of the average survivability per-hostile encounter means insurance rates offered for the Cerberus can’t be beat! There’s been a gap between the high-end Astral carrier and the low-end small carriers or non-dedicated carriers like the Venture and Condor for quite a while and it’s time that we filled it. Why, the world needs a military-grade medium carrier, so that’s what the world is going to get! Let’s see this one in action, shall we? Looks pricey. But you only live once, right? Let’s buy that sucker and take it for a ride! This is not what a fleet admiral who knows when to take the initiative, hit quickly, and withdraw would do. This is what happens when the captain is busy snapping photos out the side window as a pirate armada unleashes wave after wave of missiles. 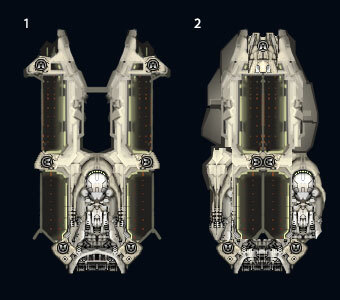 You can see my first couple designs for the Heron to the right, and I wasn’t happy with them: #1 simply doesn’t scream “Hegemony” to me and #2 looks like a kitchen sink. And as soon as I realized that I could never unsee it and so the prototype was dumped in the orbital scrapyard of Arcadia II with the rest of the dross. Similar to the Cerberus, the process of drawing the Heron took the classic Eagle/Hawk shape as a base but changed the rendering to be somewhat less greebly and squarish, more rounded and smoother lines, focusing on the overall composition more than the details. I used the colour scheme and some of the rendering of the Valkyrie as more of an inspiration, as a sort of alternative mid-tech military style that’s a little greener with orange touches vs. the greyish beige of the original Hegemony/Domain Armada ships. Alex found initial performance of the Monitor to be underwhelming so he requested I upgrade two of the turret slots to medium size, and so as you can see it is done! This hull also gets a unique hull mod to support its tactical role that I’ll let you discover on your own when the next version is released. If every ship was totally awesome then no ship would be totally awesome. 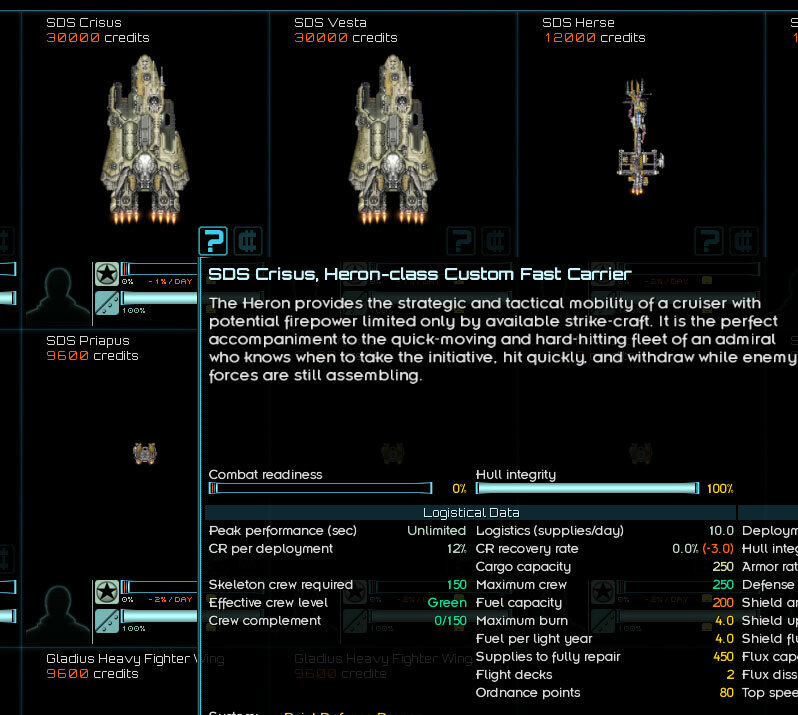 Starsector needs standard “boring” workhorse ships, and thus we have the Hermes (#1), formerly the “Shuttle”). The Hermes has received an additional turret slot so it isn’t utterly useless and it’s been given an increase in size. The same treatment as been given to the Mercury (#2) which fulfills a similar gameplay & narrative role, though with energy weapons and a way more rockin’ holovid system. If you can’t be great, a humble “good enough” may suffice. That’s all for now, thanks for reading! Check out the comment thread here. This entry was posted on Monday, December 30th, 2013 at 9:41 pm	and is filed under Art, Lore. You can follow any responses to this entry through the RSS 2.0 feed. Both comments and pings are currently closed.